The USDA’s first condition rating on May 27, 2018 indicated that 79 percent of the U.S. corn crop was rated in good or excellent condition. This information has undoubtedly contributed to the rapid drop in corn futures prices in recent weeks. Previous farmdoc daily articles (May 24, 2017; June 1, 2017) have emphasized the limited information in early season crop condition ratings. In particular, the analysis in these articles indicated: (1) there has been a strong correlation between trend-adjusted U.S. corn yields since 1986 and the percentage of the crops rated in good or excellent condition at the end of the season; (2) the correlations between crop conditions and yields are low early in the season and then rise sharply for corn into mid-July; and (3) an adjustment to the ratings for a seasonal pattern of bias improves early season yield forecasting. The purpose of this article is to update our earlier analysis and then draw implications of the current high condition ratings for 2018 corn yield expectations. We begin by analyzing the first and last observations for the crop rated in good or excellent condition for corn in each crop year available over 1986 through 2017. Figure 1 shows trend towards a higher percentage of the crop rated good or excellent in the first rating. The trend indicates an increase of about 0.12 points per year, but the trend has low explanatory power (R2 of about 0.015). While the upward trend is small each year it cumulates to about four percentage points over the entire sample. Figure 2 shows a small trend towards a lower percentage of the crop rated good or excellent in the final rating. The trend shows a decline of about 0.09 points per year, but the trend has no explanatory power (R2 close to zero). The change in the percentage of the crop rated in good or excellent condition from the first to the final ratings of the season is shown in Figure 3. The change shows considerable variability over the previous 31 years, with large changes occurring in the drought years of 1988 and 2012 when the percentage of the crop rated good or excellent declined by 45 and 52 percentage points, respectively. The largest increase, 24 percentage points occurred in 1990. There has been a tendency for ratings to decline from the first to final rating, with the percentage rated good or excellent declining in 18 years and increasing in 13 years. 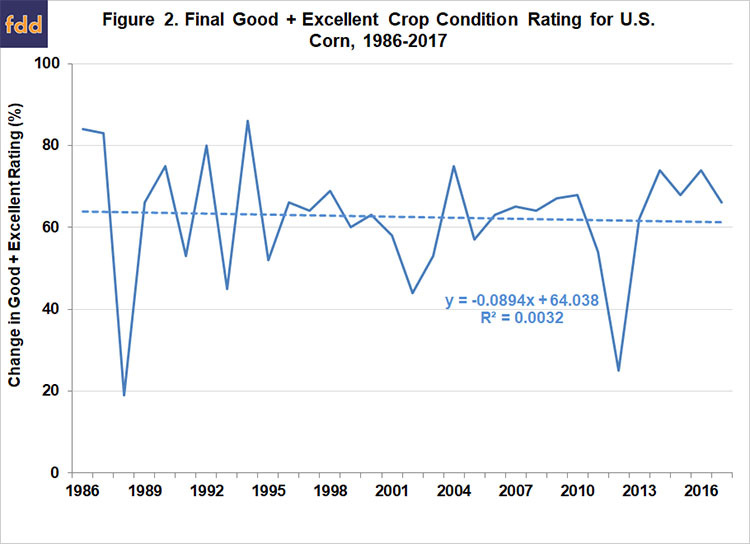 In our previous analysis, a discernable structural change in bias was shown to occur after 1999 in the good and excellent crop condition ratings for corn. On average, the change in the percentage rated good or excellent declined by 1.2 points from the first to the final rating during the 1986-1998 period. From 1999 – 2017, the change dropped by 7.2 points from the first to last rating. For the entire period, the change declined by 4.7 points. Since 1999, the changes in the percentage of the crops rated good or excellent from the first to the final ratings shows declines in 13 out of 19 years. The implication is that the first rating of the season has tended to be biased, in that it over-estimated the final percentage of the crop rated good or excellent. Since a structural change in the bias is noticeable after 1999, yield forecasts early in the season should account for this factor. The bias does not imply an error in the first ratings of the season, but rather that the crop typically is in good condition early in the season and then conditions either maintain or deteriorate based on adverse weather. 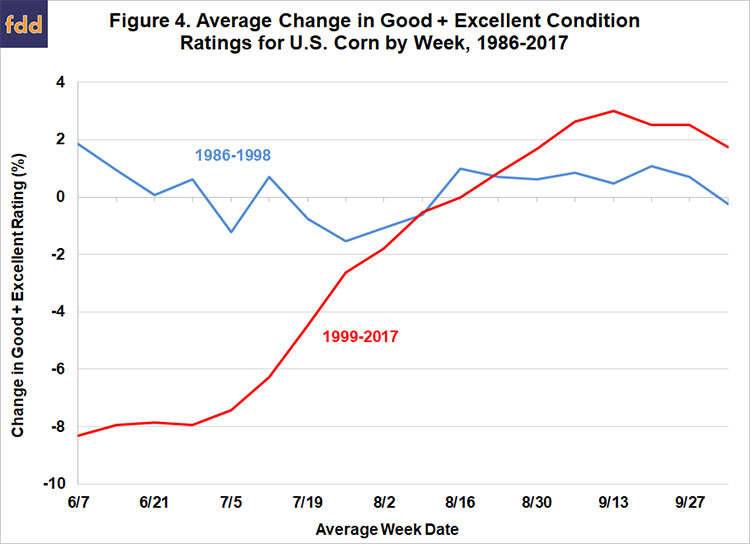 The large change in the magnitude of the bias in the first crop rating of the year beginning in 1999 could be the result of a trend towards a smaller percentage of the crop rated good or excellent in the final rating, a higher percentage of the crop being rated good or excellent in the first rating, or a combination of the two. As shown in Figures 1 and 2, the larger bias in the first crop rating for corn observed since 1999 is a result of a combination of the trend towards a higher percentage of the crop rated as good or excellent in the first rating and a lower percentage in the final rating. 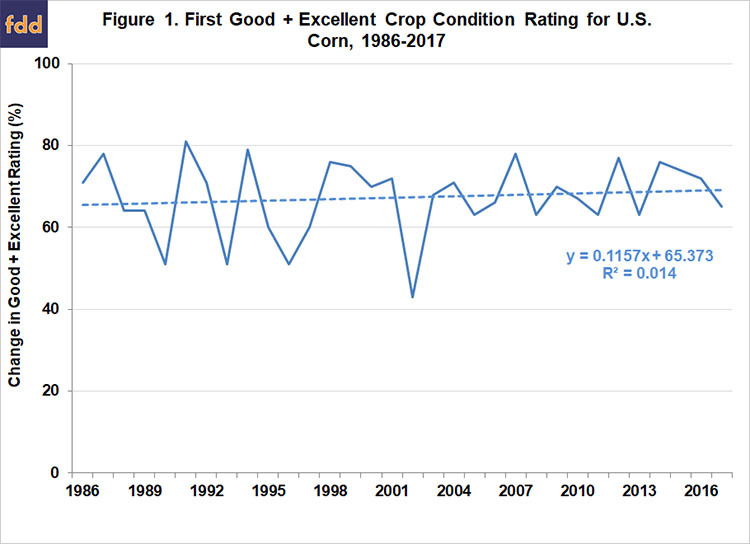 The reasons for the trends in crop condition ratings in the first and final ratings and the structural change observed beginning in 1999 are not known. Those changes could be related to changes in weather patterns that influence condition ratings, changes in crop production practices, or changes in the methodology of estimating crop conditions. Some speculate that changes in the make-up of crop observers over time may also have contributed to the change. Regardless of the reason, going forward it is likely prudent to use the larger bias since 1999 to adjust the first rating in forming yield expectations. We repeated the analysis on changes from final crop conditions, depicted in Figure 4, for each week of the growing season beginning in the first week of June. We calculated the average change (bias) in the percentage of the crop rated good or excellent in the rating for each week and the final rating of the season. Those averages were calculated separately for the periods 1986 – 1998 and 1999 – 2017. As expected based on the analysis of the bias in the first rating of the season, the pattern of the average weekly bias during the growing season was very different in the early and later periods. In the early period, the average weekly bias was in a very narrow range from -1.5 to +1.9 with the average bias generally less than one point from early August through the end of the season. In contrast, the average weekly bias in the latter period was near -8 points from early June to early July and then steadily approached zero by mid-August. The average bias then increased to nearly +3 by mid-September before declining slightly through the end of the season. 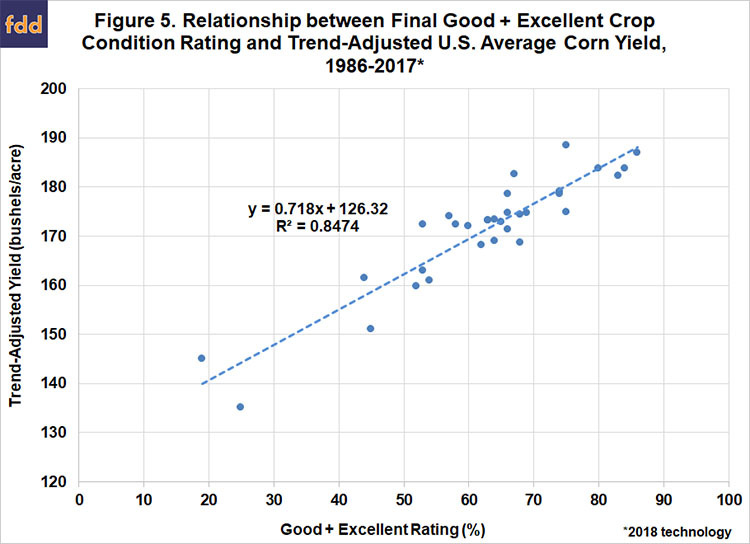 An assessment of modeling corn yield for the period 1986 through 2017 using end-of-season good and excellent crop condition ratings is shown in Figure 5. It should be expected that the relationship between yield (adjusted for trend) and the combined percentage of the crop rated in good and excellent condition would be the strongest at the end of the growing season when uncertainty about growing conditions has been largely resolved. The percentage of the crop rated good or excellent in the final report of the year explained nearly 85 percent of the annual variation in the trend-adjusted U.S. average corn yield. Corn yields are adjusted to 2018 technology using linear trends for 1986-2017. Further evaluation of good and excellent crop condition ratings and corn yield is provided in Figure 6. 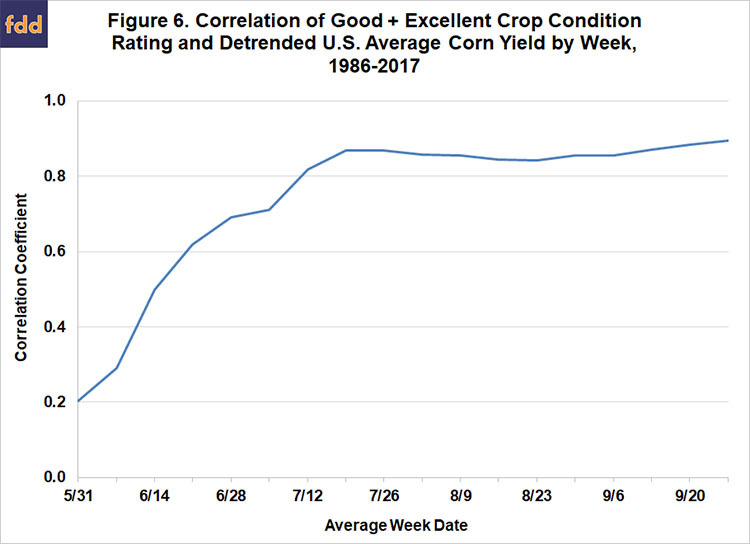 The correlation between average weekly good and excellent crop ratings with the detrended, final corn yield shows a very low correlation early in the growing season and then strong growth to approximately 0.82 in the second week of July that continues until the final crop rating. This analysis provides support for bias adjustment using the final crop ratings to more accurately project corn yields early in the growing season. The strong relationship after early July gives credence to using crop condition ratings for projecting yield potential throughout the remainder of the growing season. By conditioning the implied yield for bias in rating as we move through the early portion of the growing season, a more accurate presentation of yield potential is attained. But even after making this adjustment it must be said that the relationship of early season ratings and final yields will still be weak, on the order of only 0.2 to 0.4. A widely used method of forecasting corn yields is based on the relationship between end-of-season good plus excellent crop condition ratings and final yield. One can then plug within season ratings into the model as they become available to project yield in real-time. However, this method can suffer from the tendency of ratings to be biased upward early in the season because the crop typically starts in good condition and then conditions either maintain or deteriorate based on adverse weather. Here, we investigate the magnitude and seasonal pattern of the bias. 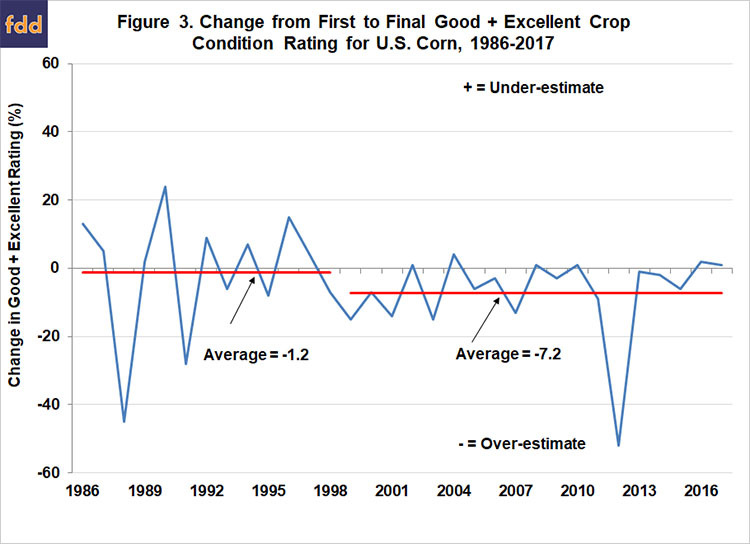 We also show a structural change in the magnitude of the upward bias in first crop condition ratings starting in 1999. The reasons why the bias would increase so sharply are not clear. This projection is only 2 bushels higher than the USDA’s trend projection of the U.S. average corn yield for 2018, but is 5.2 bushels higher than the unconditional trend estimate (171.2 bushels per acre) derived from the crop condition model. If we alternatively make no bias adjustment, the projected corn yield assuming 77 percent good and excellent ratings increases to 181.6 bushels per acre. Given the sharp drop in futures prices in recent weeks, it appears that the market has not been discounting the early season condition ratings for corn as much as history would suggest. Regardless of the degree of bias adjustment, the correlation of condition ratings this early in the season with final U.S. average yields is very low, on the order of only 0.2 to 0.4. This suggests that yield projections based on crop conditions this early in the season should be treated with a great deal of caution. The good news is that we will know a lot more about yield prospects in just a few weeks.